Every story starts somewhere . . . But for many, where it begins is also where it ends. The stories of people around the world come with a predictably heartbreaking end for many of them—simply because of where they were born. People living in remote jungles, rugged mountains, and vast deserts, are cut off from medical care, education, clean water, community development, and hope. We believe that people living in isolation have the same potential as anyone else. Given the chance, many could go on to accomplish the incredible. They can rewrite their stories—they can change the course of their families, their communities, and even the world. All they need is an opportunity. With the help of people like you, MAF has been changing endings for over 70 years! Join us in this global effort! But what if there was a simple way to change that? What if all they needed was an opportunity? We believe every person has unlimited potential whether they live in London, New York, Sydney, or in remote jungles or rugged mountains and deserts. We believe every person deserves the chance at a better life regardless of where they live. All they need is an opportunity. We're Mission Aviation Fellowship, and we overcome barriers to help countless communities change their endings. MAF is a global, non-profit, faith based organisation that for over 70 years, has used aviation and technology to reach isolated people around the world. We partner with hundreds of organizations to reach people who would otherwise be unreachable—bringing life-saving medical care, food, doctors, aid workers, missionaries, disaster relief, community development, and more to some of the most remote places on the planet. You can help change the ending. We're inviting you to partner with us to help Change the Ending to enable isolated people to overcome the barriers standing between them and a better future. In fact, with almost 75 years of experience, we've gotten pretty good at it (even if we do say so ourselves). With your support, we can change the ending. All it takes is a small airplane and people who care. So how can I help change the ending? Complete the form below to receive a FREE subscription to Flying for Life, our quarterly publication. Then, click the button below to explore MAF Canada’s main site for more content including inspiring videos and current stories from those who are working to help change the ending. Consider making a special tax-deductible gift today that can help change the ending for isolated people around the world. Curious to see how your gift will be used? Click the button below to discover the ways your donation dollars can be used to help change the ending. Are you Pilot, AME, IT specialist, or teacher (or know someone who is)? Consider applying your skills and training to help change the ending for others in very practical ways. Click the button below to learn about our current opportunities for those willing to help change the ending with MAF. Title * Mr.	Mrs.	Miss. Ms.	Dr.	Rev. Please note that regular mail delivery of Flying for Life is only available to Canadian addresses. Please send me a subscription to Flying for Life as well as invitations to MAF hosted and attended events in my area, and periodic updates on MAF's work around the world. I may be contacted by e-mail or postal. Yes! 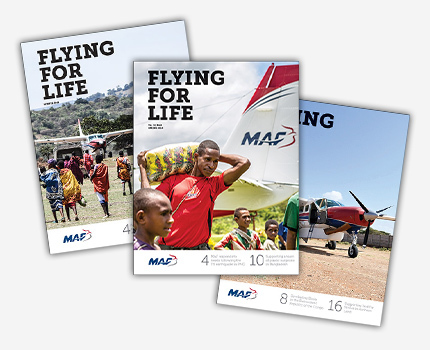 Please send me a FREE complimentary subscription to MAF Canada's publication, Flying for Life, along with periodic updates on MAF's work around the world, and invitations to MAF hosted and attended events in my area.